Photo courtesy of UNI men's basketball and their twitter handle (@UNImbb). Chances of receiving an at-large bid are now gone! With tonight's loss, the fate is sealed for the Evansville Purple Aces: Three wins at Arch Madness is the only way to get into the NCAA Tournament. CEDAR FALLS, IOWA---"Any time you play on the road, it doesn't matter who you are playing. It is going to be a dog fight." Just past the half way point in conference play, the ten teams in the best conference in all of college basketball, the Missouri Valley Conference, has reached its "grind it out" games. It means, just like Matt Bohannon said less than a month ago, anyone can get be defeated on any night to any team (unless you are Wichita State). Therefore, is it really a surprise that after knocking off Southern Illinois on Sunday, the Northern Iowa Panthers stole another quality win at home against the Evansville Purple Aces this evening? Holding "The Valley's" leading scorer D.J. Balentine to a season-low 9 points and receiving 39 of their 57 points from the guard trio of Wes Washpun (14 points), Matt Bohannon (13 points), and Jeremy Morgan (12 points), UNI fought out a win in the fortieth minute by the score of 57-54. The teams trading runs early, the Panthers originally pulled ahead to a quick 5-0 edge on the shoulders of Jeremy Morgan, who made the first two shots of the game, before some back-and-forth action ensued and the Purple Aces grabbed their first lead with an Adam Wing layup at the 13:31 mark (10-9 UE). However, "J-Mo", aka Morgan, continued his hot start with his second triple of the game, which started a 20-8 prowl that was progressed with two more three-pointers, this time from Matt Bohannon. 29-18 Northern Iowa! The McLeod Center was rocking! 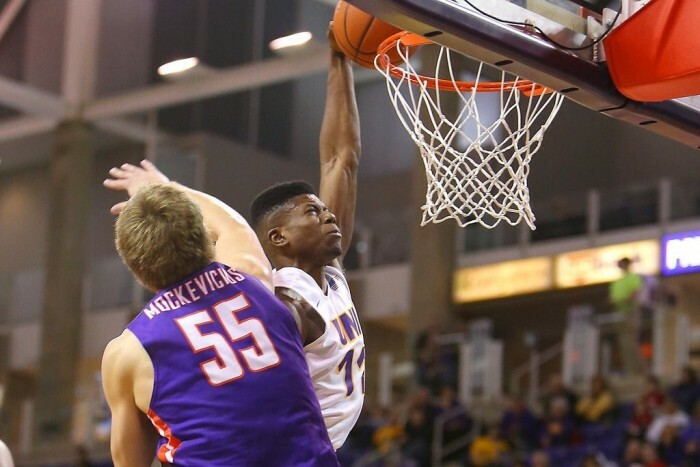 Though, the lead would not completely hold, for Egidijus Mockevicius flexed his muscles in the paint with a very nice post move layup and a rim rocker, ultimately pulling Evansville within eight heading into the intermission (32-24 UNI). Coming out for the second twenty minutes, "Iggy" persisted in his torturing of the opponent's defense by once again taking it to Northern Iowa freshman Bennett Koch. Furthermore, and even worse for the home team, the Purple Aces rolled off eight straight, capped by two of Blake Simmons' nine, to seize their first lead since 10-9! We had ourselves a ballgame! From the coach's son's deuce with 14:15 remaining in regulation, the two preseason favorites stayed close to one another for the duration considering the biggest margin separating the two was four. Thus, with 1:12 left UNI head coach Ben Jacobson burned his second to last timeout trailing only one. Unfortunately for him, he didn't get the possession he desired as Morgan probed the lane but was double-teamed forcing a turnover via a jump ball. Evansville now had the opportunity to be up three prior to presenting back the ball to the Panthers. As the shot clock slowly dwindled, the ball was passed from Balentine to Mislav Brzoja. Brzoja started his drive and had Jaylon Brown wide open in the corner for a trey. He threw it out of bounds! The ball was back in Northern Iowa's paws with a chance to swing back in front (32.4 seconds left). Wes Washpun brought the ball up-court. Though, instead of chewing up some of the remaining clock, the former Tennessee transfer took the ball to the rack and banked a floated just outside the paint. 55-54 Panthers! Following a timeout by Evansville head coach Marty Simmons, the Purple Aces were in the exact same situation as the previous possession as time was running out, for the game clock was under ten seconds! And again, Balentine passed up the final shot. Jaylon Brown caught the ball from the short corner and drove into the lane. Swat! Jeremy Morgan had blocked Brown! Although Evansville did have one more chance after J-Mo's charity stripe makes, Balentine's half court heave for the tie was wide right. It was just another night in Cedar Falls, Iowa, for the Panthers. Less than two weeks ago, the Northern Iowa Panthers were 2-6 in MVC play and four games back from second place. Three games later, Wes, Bo, and J-Mo are on a three-game winning streak and only two games back of the aforementioned position. Not expected by many, UNI has rose from the ashes and saved their season in the process. Since the Missouri Valley Conference has expanded to ten teams, no squad have played on Thursday night and won "Arch Madness." So, the emphasis to turn the season around was pivotal. But, they are not out of the woods yet! Currently in seventh, the Panthers must hop one more team to stay out of the opening round. Can they? 13-11 (5-6) Northern Iowa will continue their journey up the ladder on Saturday when traveling to Drake. Frustrated, like most that face Fred VanVleet's Shockers, Evansville Purple Aces' superstar D.J. Balentine commented, "I won't personally have a game like that going forward. I'll be a lot better from here on out. That won't happen again" after going 4-of-18 for 18 points Sunday afternoon. Tonight, he had a season-low 9 on 4-for-15 shooting. Is that bad? It's not good! No slander towards Balentine, a contest at UNI after Wichita State is fairly cruel and unusual punishment if one thinks about it. Really, everyone's stats were subpar in the scoring department on Wednesday. Egidijus Mockevicius? 13 points with 14 rebounds. Jaylon Brown? 2 points. In fact, the only players who produced more than normal was Adam Wing (10 points), Blake Simmons (9 points), and Christian Benzon (6 points). However, "normal Balentine numbers" must be present on Saturday because it will be "Miller Time" inside the Ford Center. That's right, Dequon Miller's Missouri State Bears are coming to Southern Indiana, and they are playing very good basketball. With Chris Kendrix and Camyn Boone back, one can make the case that they have one of the best trios in "The Valley!" VAVEL USA will have full coverage from the MVC showdown. MVC Dunk of the Year? If ever a dunk deserved to be worth more than two points, the recipient is Wes Washpun. Granted, he does not sneak up on anyone with his jumping--maybe the better term is soaring--ability; still, to throw down a vicious, "mothers shield your children's eyes," slam dunk over the Missouri Valley Conference's best center Egidijus Mockevicius is truly impressive. Don't think so? Then how about have another look. Yeah, MISSOURI VALLEY CONFERENCE DUNK OF THE YEAR!